The fall issue of FB&C always contains a holiday gift guide, in which Nate Pedersen and I highlight about fifteen bookish items that might make a nice present (for you or for someone else). Obviously, this list often contains books, old and new. 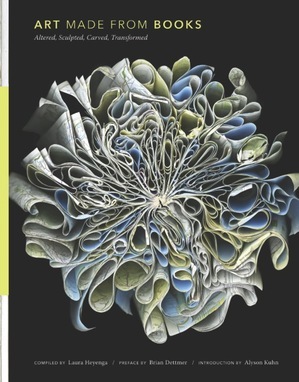 There were three new books that made the list this year -- Art Made From Books: Altered, Sculpted, Carved, Transformed (Chronicle Books, $27.50) is one of them. Compiled by Laura Heyenga, with a preface by Brian Dettmer and an introduction by Alyson Kuhn, it is, by coffee table book standards, rather slim and handy. It is an anthology of artists who use books as their primary material in making art -- this could mean “treating” a book with any number of tools and instruments, from scissors, X-Acto knives, and needles to ink, paint, and glue. The first thing one notices about this book is the creative binding -- the front and back boards seem to float in place while the sewn (and glued) signatures are fully visible along the spine, where a strip of chartreuse binding tape holds it together. Inside is a beautifully illustrated look at working book artists. Some of them will be familiar to readers of this magazine--in the past we have featured the work of Brian Dettmer, Guy Laramee, and Jeremy May--while others no doubt have a following among artists, collectors, and dealers. Su Blackwell’s book tableaux invite viewers into her captivating storybook world, while the intricacy of Julia Strand’s three-dimensional collages are astounding. I have long enjoyed the bookish photography of Cara Barer, and it’s nice to see large, color reproductions of some here. There are also great photos of the book sculptures left around Edinburgh by an anonymous artist in 2011. Her sculpture marking the publication of Ian Rankin’s The Impossible Dead, showing a couple of paper skeletons drinking, smoking, and listening to records, is particularly striking. If I had one gripe with the selection of artists presented here, it’s that the focus seems to be on younger artists, shunning the artists who, in many ways, created the field. For example, Doug Beube is one of the most experienced book artists in this book. He started altering books in 1979. (Beube is the subject of our winter issue’s Book Art column.) On the other hand, reading up on the newer artists is ideal for collectors. Compiled by Laura Heyenga, with a preface by Brian Dettmer and an introduction by Alyson Kuhn, it is, by coffee table book standards, rather slim and handy. It is an anthology of artists who use books as their primary material in making art -- this could mean "treating" a book with any number of tools and instruments, from scissors, X-Acto knives, and needles to ink, paint, and glue. The first thing one notices about this book is the creative binding -- the front and back boards seem to float in place while the sewn (and glued) signatures are fully visible along the spine, where a strip of chartreuse binding tape holds it together. Inside is a beautifully illustrated look at working book artists. Some of them will be familiar to readers of this magazine--in the past we have featured the work of Brian Dettmer, Guy Laramee, and Jeremy May--while others no doubt have a following among artists, collectors, and dealers. Su Blackwell's book tableaux invite viewers into her captivating storybook world, while the intricacy of Julia Strand's three-dimensional collages are astounding. I have long enjoyed the bookish photography of Cara Barer, and it's nice to see large, color reproductions of some here. There are also great photos of the book sculptures left around Edinburgh by an anonymous artist in 2011. Her sculpture marking the publication of Ian Rankin's The Impossible Dead, showing a couple of paper skeletons drinking, smoking, and listening to records, is particularly striking. If I had one gripe with the selection of artists presented here, it's that the focus seems to be on younger artists, shunning the artists who, in many ways, created the field. For example, Doug Beube is one of the most experienced book artists in this book. He started altering books in 1979. (Beube is the subject of our winter issue's Book Art column.) On the other hand, reading up on the newer artists is ideal for collectors.